On the weekend of March 9 – 10, we in the Diocese of Rockford will be given an opportunity to stand in solidarity with those who suffer and are marginalized throughout the world. As part of this international collection, we also contribute to the excellent work of Catholic Relief Services around the world. CRS works through established programs to be among the first responders in disaster situations such as the recent tsunami in Indonesia. A third beneficiary of this collection is the Church in Central and Eastern Europe. This collection supports the Church in more than 20 countries which continues to struggle in recovering from the aftermath of communist rule. As always, the collection is also an occasion to contribute to the pensions of the retired priests of the Diocese of Rockford who have faithfully served us and our families, and to support our diocesan Catholic elementary schools. In each of these appeals, we have the opportunity to stand with the Church in Her works of mercy and charity. Please be generous as you prayerfully consider your contribution to this combined collection. The Peter’s Pence Collection provides the Holy Father with the funds he will use to respond to needs around the world. The proceeds will benefit victims of war, oppression, and disasters. Last year, the people of our Diocese contributed $174.727 to this collection. Your support for this collection gives aid to victims of persecution and natural disasters, provides legal services to poor immigrants, and advocates for the powerless. The reach of CRS spans the globe, helping families on every continent, with an array of ethnicities and backgrounds, addressing a myriad of needs. Last year, $68.977 was distributed to this appeal. The fall of communism occurred over 25 years ago, but the Church in former communist countries continues to struggle to rebuild after years of oppressive rule. Many churches in this region were confiscated or destroyed, leaving the faithful without a place to worship or to find pastoral support. Your support of this collection helps rebuild churches, supports seminary programs, promotes ministries and education for children and families, and renews community life around the region. Last year the faithful of the Diocese contributed $21.730 to this appeal. 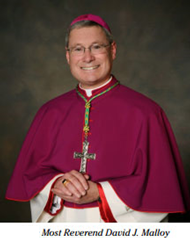 Whenever a natural disaster occurs and/or a significant need exists, Most Reverend David J. Malloy receives numerous petitions for financial assistance from the affected areas, the USCCB, or from news reports from natural disasters. With the creation of this fund, he has resources available to respond on behalf of the people of the Rockford Diocese. This pastyear, Bishop Malloy distributed a total of $20,000 to aid the Hurricane Irma and Hurricane Harvey victims. Our priests devote their lives to bringing people closer to Christ, and in retirement, our priests continue to serve as spiritual leaders, counselors, ministers to the sick and much more. With gratitude for their years of faithful ministry, the Diocese has a Priests’ Pension to support our 53 currently retired priests and those that will retire in the future. Monsignor Dzielak has served our Diocese for more than 55 years and continues assisting pastors in celebrating the sacraments in parishes during his retirement. We thank you, Monsignor Dzielak, and all our priests for your continued faithful service in retirement. Last year, the faithful of our Diocese contributed $141,886. Your prayerful support and donations will help the underprivileged schools in the Diocese of Rockford to continue to educate and provide religious and moral formation to their students. Thanks to your generosity, this collection provided $43,059 to needy schools in our Diocese last year.